Traditional development approaches for software reach their limits when software is to be developed as part of a multidisciplinary (often mechatronic) system. In his presentation in the realm of the LCM forum “ICT in Mechatronics”, Dipl.-Ing. 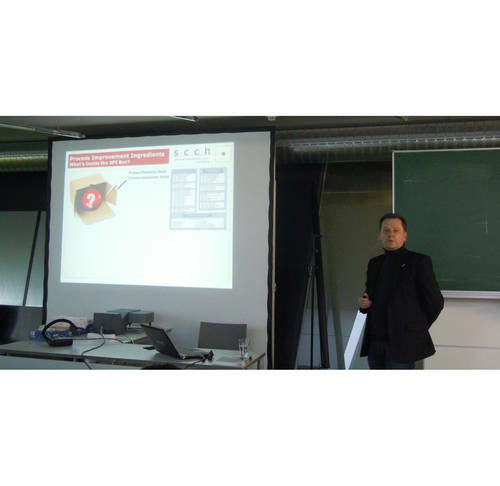 Friedrich Stallinger of Software Competence Center Hagenberg introduced refined models of software development where software is developed and extended as a product and simultaneously as part of a superordinate software-intensive system product. In addition to embedding software in multidisciplinary systems, other prominent challenges in software development include the general increase in the scope of functionality, the complexity and the variability of such multidisciplinary systems along with the pressure of rising costs and productivity. A promising approach is to view the development of systems in a reuse- and product-oriented way, but this demands efficient and effective product management. While established life-cycle process models of software development do emphasize the importance of reuse, they typically lack product management practices. Established life-cycle models of software development typically lack both reuse- and product management practices. In his presentation, “Reuse and product management as core elements of evolution- and strategy-oriented system development”, Stallinger introduced software development models that were developed jointly with industrial partners and both enhance life-cycle process models of software development with software product management aspects and refine life-cycle process models of software development and extend them with reuse aspects. On this basis, he sketched how both models can be integrated in a framework for process evaluation and improvement for contexts in which software is developed and extended both as a product and as part of a superordinate software-intensive system product.